As with eLearning, VILT was initially seen as a way to offset the high cost of face-to-face training. VILT was often done through webinars that acted as virtual lectures. Although these trainings were easy to deliver, the end result for the learner wasn’t always effective. 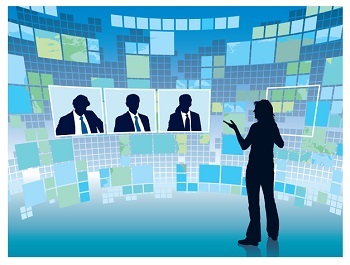 Today, learning organizations are better equipped to deliver more engaging virtual training. Learning professionals are creatively using VILT to enhance large-scale training initiatives by blending together multiple delivery methods, including eLearning, instructor-led training (ILT), VILT, and informal learning. Using VILT as a component of the L&D toolbox, organizations can reap financial savings. As those dollars add up, VILT continues to prove its worth as a value-add for the organization. Virtual ILT helps organizations save money by reducing the time and travel associated with face-to-face ILT. Virtual delivery allows workers to stay at their workplace while still attending training. There may also be cost savings from unneeded facility rentals. Virtual segments can (and should) be shorter in length, allowing participants to spend less seat time in training—another savings. Another significant savings is the reduction in printed materials required. Materials for VILT sessions are delivered or are available to participants through virtual outlets. 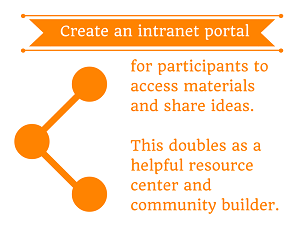 L&D departments show their value when they recommend establishing a portal within the organization’s intranet for participants to access materials and share ideas. Social media tools can also serve as collaborative platforms to support virtual ILT. It’s easy to see how quickly the cost and times savings can add up from using VILT. The use of VILT in asynchronous training initiatives helps to support learner autonomy—a valuable currency in adult learning—while acting as a conduit to connect the organization’s people. Shared experiences themselves create a bond between people; leverage the virtual format and shared experience of VILT to connect people and teams across borders. The nature of VILT facilitates interpersonal connections that are collaborative in a way that only occurs through training programs. Coworkers may be geographically disparate, and VILT can enhance connections between those people and departments in more meaningful ways than are possible over phone and email alone. Sharing pictures of teams, and even their work environments, creates a camaraderie that builds into the larger team—the VILT session’s participants. With connections established, VILT guides those participating to collaborate in a variety of ways. Traditional forms of communication can be used, but VILT opens doors to collaboration in other formats. Structure communication paths ahead of time, during the analysis and design phases of VILT development, to reinforce this engagement between participants. Facilitators should repeatedly direct learners to use virtual methods to continue collaboration after the formal training event is complete, in an effort to continue building these connections. VILT easily builds into an organization’s infrastructure by supporting its people and reinforcing the culture of collaboration. Most organizations recognize their workforce as the valuable asset it is, but a related asset that continues to be largely undervalued is knowledge management—the collection and organization of knowledge and information within an organization. Every organization contains vast knowledge in an array of topics: the organization’s product or service, procedures and operations, financial status and future growth strategies, and more. Forward-thinking L&D organizations include the content from training programs and deliverables in this, as well. It’s important to consider the content from those initiatives as highly valuable, as it builds into the overall knowledge of the organization. Elements and portions of VILT programs easily transfer into a knowledge repository for future use, which reinforces the strength of the organization’s information. It is a best practice to record VILT sessions. Those recordings are typically provided to participants for reference of the session they attended, and the recordings can easily be added to an accessible area (like the portal mentioned earlier) for participants and others who couldn’t attend the session. This creates a library of content that can grow as future training programs are designed and implemented. Recordings can also be repurposed for other training events—one-time reinforcement sessions or as a part of a larger training initiative. With a little bit of editing, those recorded sessions could also be sliced and reorganized or connected to other elements. Individual recorded sessions, or segments of them, can be used as standalone pieces for just-in-time resources, providing learners instant access to content. When L&D departments leverage the content within training programs to enhance the organization’s knowledge management, the department’s value increases. This organization of knowledge and information provides reinforcement for the growth of the workforce and the company overall. This growth enhances the organization’s bench strength and paves a path for strategic succession planning. Viewing VILT as a multifaceted element that can build into an organization’s infrastructure allows this flexible delivery method to be used in creative ways while saving time and dollars. VILT supports the organization’s workforce by connecting people across teams and departments, all while reinforcing a culture of collaboration. And when VILT is seen as a path to building into the knowledge management, the organization reaps the rewards for future use of content and preparing its people. Virtual learning shouldn’t be an organization’s only training delivery method, just as traditional ILT or eLearning shouldn’t be the only methods used. But when used to its fullest, VILT is much more than a mechanism for virtual meetings. Joelyne "Joie" Marshall is a learning solutions manager with Caveo Learning. Joie combines an MBA from Roosevelt University and a bachelor’s degree in electronic media from Northern Illinois University to design and implement learning solutions that are innovative, engaging, and deliver maximum business value to organizations. A former executive board member with the Association for Talent Development, Chicagoland Chapter, Marshall has presented at the Chicagoland eLearning & Technology Conference, the ATD Hawkeye Conference, and the Bank Trainers Conference, as well as facilitating workshops for ATDChi and the Chicago Chapter of the International Society for Performance Improvement.